While I love the look look of poinsettias and other traditional holiday pot plants, I never know what to do with them once the holidays are over. It seems to be against my gardener’s code of conduct to toss them in the trash, and dumping them on the compost pile in midwinter seems equally harsh. Mine generally linger long enough to move outdoors with my other houseplants for summer vacation. Only then will my conscience allow me to neglect them enough that they fade away. 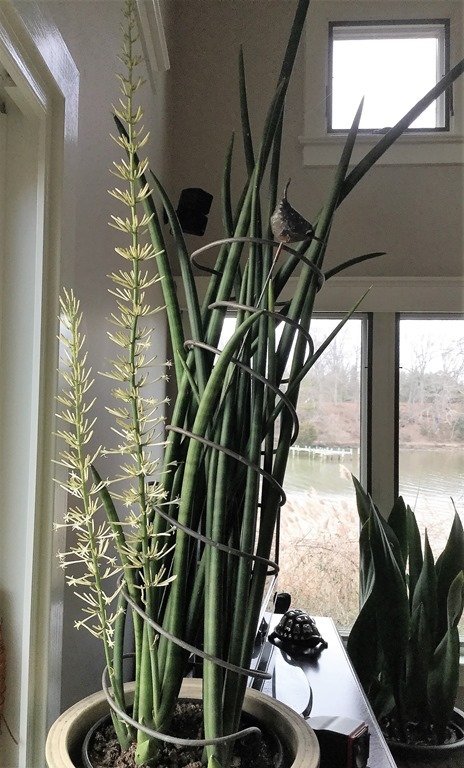 Houseplants that flower in winter—especially without scheduling and excess effort—are another matter altogether. 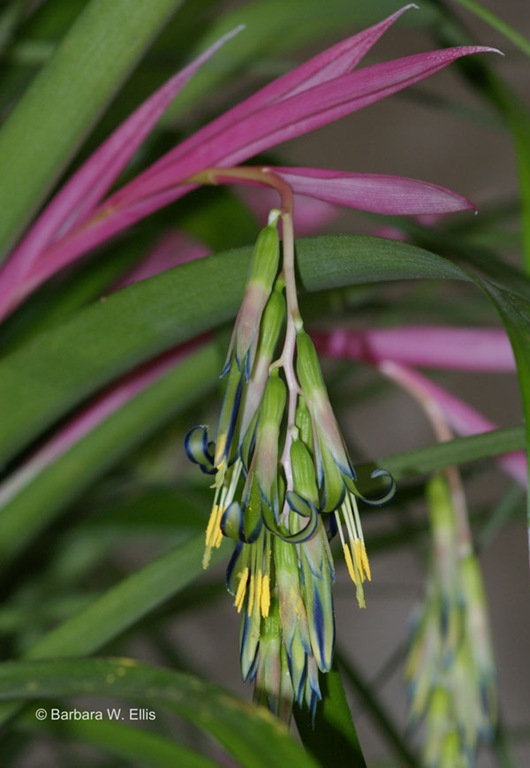 A favorite that falls into this category has just come into bloom: Billbergia nutans, commonly called Queen’s tears. Not only does this tough, undemanding bromeliad bloom reliably every winter, it does it with minimal intervention on my part. 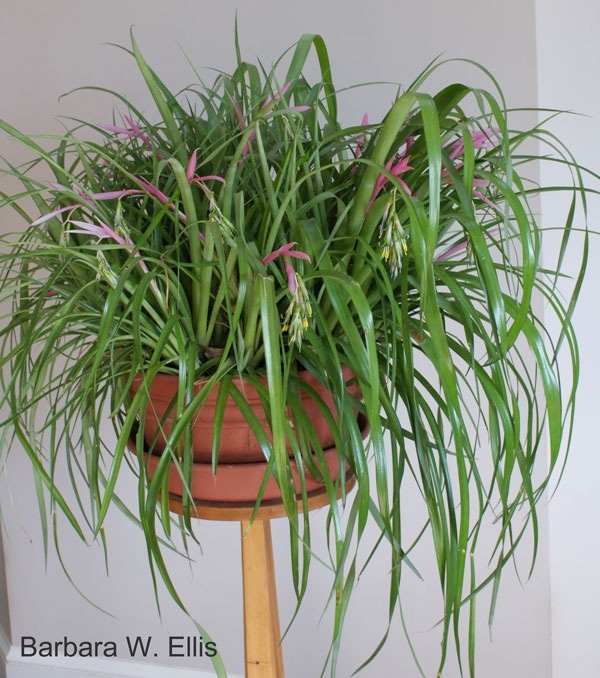 A relative of the pineapple, to my eye for most of the year Bilbergia nutans looks something like an attractive, potted ornamental grass. Handsomely arching leaves carried in tightly packed, funnel-shaped rosettes form a dense clump. The individual leaves, which have have small, widely spaced teeth, are ½-inch wide and 1 to 1½ feet long. Rounded clusters of pink bracts deep in the center of the rosettes are the first indication a plant is going to bloom. These lengthen quickly, and each eventually reveals up to four pink bracts. The flowering stems terminate in a pendulous, 6-inch-long raceme of up to 12 small flowers. The flowers, which have reflexed petals, are yellow-green with handsome midnight blue edges. Pretty yellow stamens hang below the petals. Plants stay in bloom for about two weeks, and the pink bracts remain colorful a little longer than that. Queen’s tears is among the easiest-to-grow houseplants I own. While my plant would, no doubt, respond happily to fussing, it manages to get by on the other end of the care spectrum. Occasional watering in winter, extremely infrequent misting, and little if any fertilizer seem to suit it just fine.